It’s Thursday, and because we, as a society, can barely go more than 24 straight hours without hearing any Godzilla-related news, we’ve got quite a bit for you here. For you one-more-work-day-to-go-before-the-weekend enjoyment, we’ve got a new international trailer and TV spot, another good-looking IMAX poster, and a supercut that is sure to make fans of the iconic monster tingle in all the right places. We’re as excited to see the return of the King of the Monsters as anyone, but we can’t be alone in thinking that this is getting a little bit ridiculous. You have to love that appears at the beginning of this international trailer, it links to the history that plays a big role in this particular video. The footage starts out in a familiar manner, similar to what we’ve encountered before. Bryan Cranston does a lot of yelling about how no one is fooled, that he knows this wasn’t an earthquake or a typhoon—I could be wrong, but the mention of a typhoon could be new. If you haven’t figured out that director Gareth Edwards’ upcoming Godzilla reboot is near the top of our list of most-anticipated movies of the year, you haven’t been paying attention. Not even close attention, just any attention at all. And if you didn’t know that Godzilla is happening at all, then you must have been asleep, because there has been a constant barrage of marketing, including what seems like a thousand new TV spots. And because there haven’t been enough, here are the latest two. We still have almost a month until the film hits, so you have to wonder what the final tally will be, because these things are dropping damn near every day at this point. Most of the TV ads for Godzilla have followed a certain pattern. One of the characters has a voiceover, the same bits of footage you’ve seen many times are strung together in a different order, and near the end we finally get a glimpse of the King of the Monsters himself. And this video falls into that exact routine. Elizabeth Olsen’s Elle Brody hasn’t had her moment in the sun thus far, but she now is her chance, and you catch a glimpse of her family life, complete with husband and Godzilla hunter Ford (Aaron Taylor-Johnson) and their child. Godzilla is now less than a month away and we’re seeing TV spots, posters, and all manner of promotional material drop almost daily at this point, sometimes even more frequently than that. We wouldn’t want to stop talking about director Gareth Edwards’ upcoming reboot, you might forget about it after all, so today’s installment of Godzilla-related news comes with a fantastic commercial with some impressive new footage, and an interview where Edwards shares some of his hopes for the film. The early portion of this video focus on the character side of the film, showing what they’ve lost and what they have to lose. Bryan Cranston’s Joe Brody loses his wife, Juliette Binoche, in what appears to be an accident at a nuclear facility. So he has that going on. Joe’s son, Ford (Aaron Taylor-Johnson), and his wife, Elle (Elizabeth Olsen), have each other, as well as a young child. When a giant lizard comes calling, you start to consider the possibility that all of this can be ripped away from you in a matter of moments. We’ve caught a variety of quick glimpses of the main creature in Gareth Edward’s upcoming Godzilla reboot, so we have a pretty good idea of what the King of the Monsters looks like. What we don’t know much about, however, is the other monster—hopefully monsters—that will appear in the film. We do know that Godzilla won’t be alone, and there have been quick, oblique looks in the clips and trailers, but aside from that, very little is known. That’s about to change, though, as a new line of toys reveals our first solid look at one other monster. The moment we learned that Godzilla was going to have company wrecking up the joint, fan speculation went crazy wondering which of his fellow creatures could join him for this adventure. Who could it possibly be? We’ve seen images of what appear to be wings and a creature that is flying. Is that Mothra? Is King Ghidorah going to stop by for a visit? Those two were bandied about quite a bit, but it seemed like everyone has their own favorite they’d like to see make a big screen comeback. But, as it turns out, we won’t be seeing any of those familiar faces, as it appears that they’ve gone with a wholly new character. 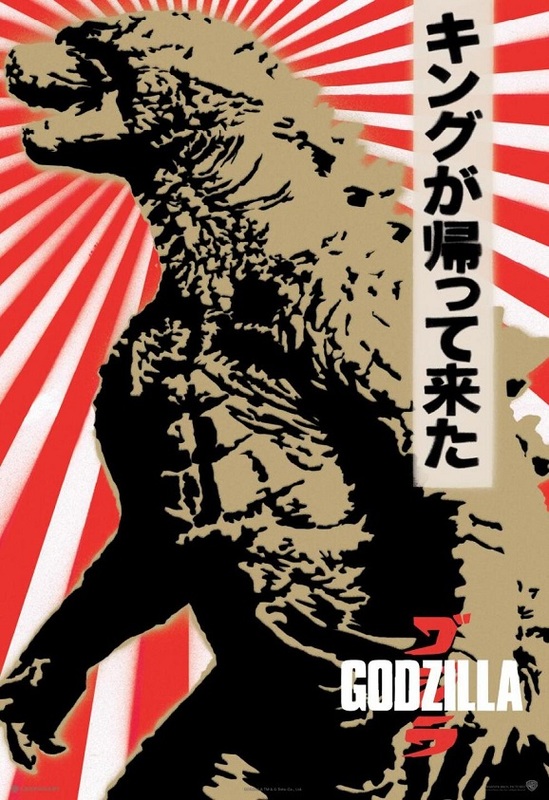 Before you know it, everything printed on paper—books, napkins, towelettes, etc.—will be rounded up by the government, recycled, and then turned into Godzilla posters, which will then become our standard form of currency and identification. “This ATM has a fee of 3 Godzillas. Do you accept?” And you always accept, because Godzilla is king. A good king is one who pays respect to history, which is something Legendary and Warner Bros. have given attention to in this marketing campaign. The King of the Monsters was born in Japan, and his effortless destruction will always be one of that country’s greatest exports. What better way to show that than to consistently put out stunning posters? The poster’s release was timed with Warner’s announcement that their upcoming WonderCon panel will focus on Godzilla, Tom Cruise’s Edge of Tomorrow, and the found footage disaster flick Into the Storm. Though the latter looks corny, the other two have the potential to be the most action-packed flicks of the year. We’re of course more interested in the King of the Monsters’ return to form from director Gareth Edwards, but there’s no denying Doug Liman (The Bourne Identity) and co-screenwriter Christopher McQuarrie (The Usual Suspects) can easily make a movie that could sway even the most venemous of Cruise abhorrers. Edge of Tomorrow dropped a new TV spot during Sunday’s MTV Movie Awards, so we can certainly expect to see new footage for all three of Warner’s films for their panel on Saturday, April 19 at the Anaheim Convention Center. We’re getting to the point where we can damn near expect to hear daily news from Warner Bros. and Legendary Pictures Godzilla reboot. Before long it’s going to be every hour on the hour. Last week we got more than half a dozen TV spots, plus an extended look. Yesterday we saw a cool, high-contrast black and white poster. Today brings two short featurettes that introduce viewers to director Gareth Edwards.